Welcome to the official Starbucks China App. The Starbucks China App is the most convenient way to enhance your Starbucks experience. Pay, reload, purchase digital Starbucks cards, and manage all your Stars, Rewards and loyalty information in one place within the app. Rewards are built right in, so start to collect Stars and earn free drinks with every purchase. Earn and keep track of your Stars, Rewards, and membership level anytime, anywhere. 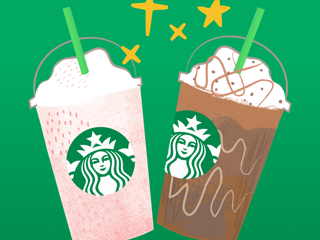 Receive unique offers as a My Starbucks Rewards member. Simply scan QR code each time you purchase. Browse and purchase a curated selection of Starbucks gift Cards right within the App. You can also conveniently check balance, reload and manage all in one place. To pay with Starbucks Gift Card, present your in-app QR code. Starbucks online delivery service has arrived in Beijing and Shanghai. Customize and place your order, and deliver to your favorite location within our stores range. Receive the latest information on new Starbucks products and promotions from Starbucks directly from your home feed and your Inbox. This update includes bug fixes, performance improvements, and a new inbox. We are continuously upgrading our App to provide you better experiences. The new arrangement is big downgrade! The new arrangement is not a good deal at all, especially for gold card members. There is no reason to even try to become a gold card member they took the one benefit away and replaced with a lame attempt to seem like they are rewarding you. Instead of ten purchases for a free drink you have to get nine stars. A star is equal to spending fifty rmb. So you could buy a coffee and a croissant and still not earn one star. I had 53 stars. (That means I’ve spent too much money at Starbucks) and I had seven tear stars. Those are the stars that count to a free drink. Than my anniversary with them comes and the tear stars are zero! So any money spent to that free drink that is already not really that much of a deal anymore was just a waste. I know the 53 stars would be gone but it’s pretty cheap to also take the what’s already not that great of a reward away. To any new members it’s not even worth it to try to upgrade. You don’t get anything. Don’t spend more than you need to. It’s a waste of money. And maybe other smaller coffee shops will do better now. There is also no way to comment in the store or on the app. So I think they don’t care if you are satisfied or not. So different from the Starbucks of the past. Too bad. While the app has some great info... it would be nice to be able to read it. Since I can only read English and Spanish and most of the announcements on the China app are in Chinese, I am unable to take advantage of what’s being advertised. There’s no option to change the info into another language. Bought ¥132 with the app and the stats haven’t shown up. Went to the store to have the credit added to the account; they messed around with the receipt and my app, said it should be fixed in 24 hours. It’s been a week and still nothing. Other than this, the app is just fine.